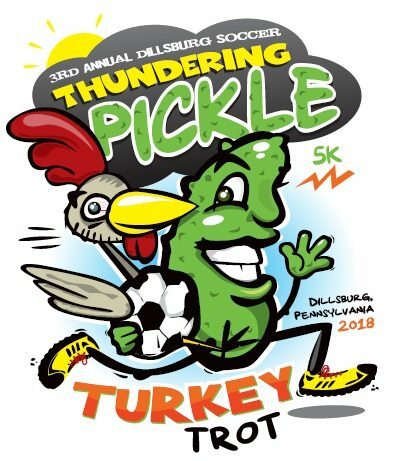 Thanksgiving morning, come to Northern High School’s cross country course for the 3rd Annual Thundering Pickle 5K Turkey Trot and Relay. DASC is a non-profit organization with the purpose to foster and promote the game of soccer for our youth. We are an all volunteer board. All proceeds benefit the youth of the Dillsburg Area Soccer Club. Top overall male and female runner. Age groups: Under 12 (Male & Female combined) 13-19 (Male & Female separate) 20-29 (Male & Female separate) 30-39 (Male & Female separate) 40-49 (Male & Female separate) 50-59 (Male & Female separate) 60+ (Male & Female separate). Awards for the 5K relay for ages 12 and under and 13 and over.